This post is a part of TMP’s Historical Context series, in which I share excerpts from my collection of vintage publications. 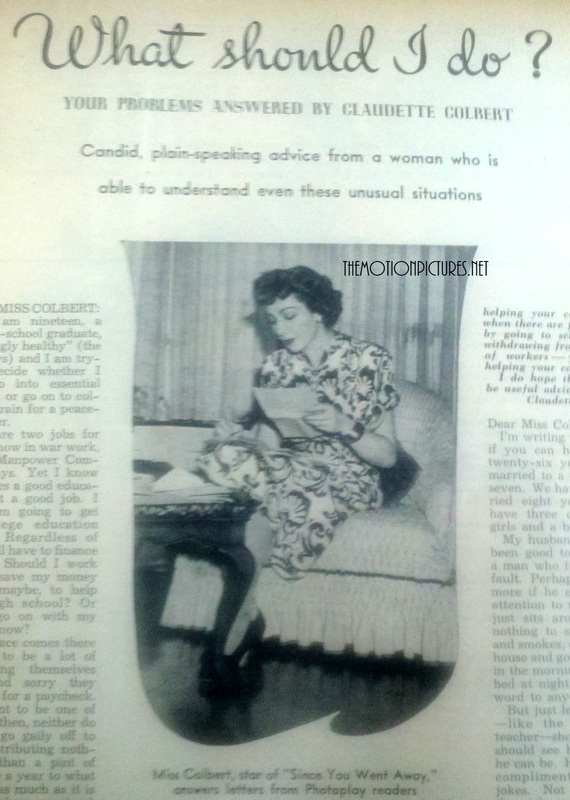 The June 1944 issue of Photoplay in my collection has a feature aptly titled “What should I do?,” which is your typical advice column… aside from the fact that it’s written by none other than Claudette Colbert! This was a monthly feature in Photoplay, and it also included a “How I Solved My Problem” section, where people who Claudette had answered could write to her again and tell her how they applied her advice. The column touts itself as “Candid, plain-speaking advice from a woman who is able to understand even these unusual situations.” Readers of the mag were able to send letters to Claudette about their problems. If their letter was chosen, they would receive a reply letter from Claudette and have their question published in the magazine. The following are the questions and answers from the June 1944 edition of the mag. Claudette (or a ghostwriter, possibly) answered six questions in the June issue; I will be sharing four in this post and the final two, plus the “How I Solved My Problem” letter, in Part II tomorrow. Your ‘strange, mixed-up name strikes me as being very pretty, and one of which you have every right to be proud. One of the most wonderful things about America is the fact that a girl or a boy can have one parent of one nationality and one parent of another, thus inheriting the fine traditions of two peoples and adding them to those of the States. Frankly I think you are letting your husband down. Your husband obviously needs pepping up and he seems only to get it from strangers because visitors always put on their company manners and try to be lively and interesting. Naturally it is hard for a woman to do housework all day, take care of three children and be a bundle of charm at the day’s end. However, that is what man has expected of a wife since the world began — and if you love your husband and want to keep him, it would be worth the effort to try this. First of all, I don’t think you at all foolish for confessing your love for a man younger than yourself. Some of the happiest marriages in the world are between persons who are not to be judged by usual standards of age. Years are like skis: Some people handle them skillfully and look graceful to the end of the run, while others crack up on the first sharp turn. In your case, it isn’t the time element that is to be considered, it is the relationship between you and your daughter. Years ago I made a picture called ‘Imitation of Life’ in which this same problem arose, although the man in the case was a contemporary of the mother’s. In that picture, the mother was wise enough and strong enough to tell the man to go away for a time; to let things work out gradually without violence. I think that is your only solution. Tell the man that, if your love is really as fine and enduring as you believe it to be, it will stand the test of separation. One of the reasons I chose your letter to answer was the fact of its being typical. Not only does Photoplay receive many hundreds of letters from girls who compare notes and find that the same boy has made love to both, but a good many boys make the identical discovery. This doesn’t mean that most men or most girls are fickle. It means that, particularly in war time, everyone tries to spare the feelings of others. There have been cases where girls married two boys, just because of an exaggerated notion of patriotism. If I were you, I wouldn’t worry about the fact that your girl friend has promised to marry your pal as well as you. Why don’t you continue to write to her as if nothing had happened. Meanwhile, look around and notice how many beautiful girls there are in the world. As you are now only eighteen, I suspect that you will meet at least a score of girls in the next ten years, any one of whom may well make you a very pleasant wife. Stay tuned for more letters in Part II, coming tomorrow! That second letter, and response, are MOST interesting. I’m sure Mrs. B. thought her husband would be the one getting ripped, and not herself! And I would hope that it was actually Claudette answering these letters, or at least getting help with them from a qualified individual, and not a ghost writer…but I’m guessing that was probably the case. So, that response I got from Richard Dreyfuss, telling me I SHOULD go out with ten women at once…I should ignore that bit of advice, because it was probably a ghost writer?